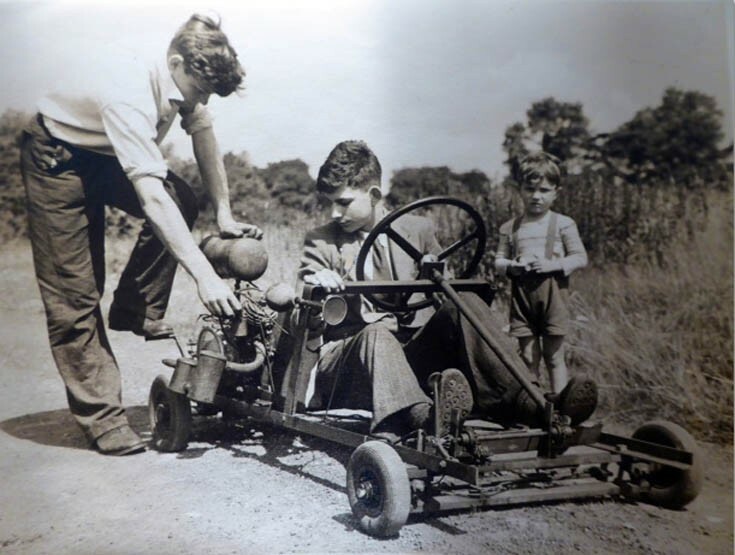 In 1948 Brian Lloyd-Jacob and two friends (Peter Billing and Geoffrey Fletcher) built the first ever 'Go-Kart'; of course the term Go-Kart had not been invented at that time but the 'Go Kart' clearly had and it was British. The picture shows Brian Lloyd-Jacob kick starting the engine into life. The vehicle does look very kart like and was powered by a 250cc Villiers engine that originally powered a generator on a boat. It is coupled through a three-speed gearbox to a live rear axle that as one driven wheel and one free rotating wheel. The wheels were solid and from a heavy duty trolley. The brake was a lever and pulley belt from a lathe operating on the rear axle! Everything was bolted together, there was no welding. The flying bedstead as it was originally known cost 12s and 6d. Thanks to Lorraine Lloyd-Jacob for letting us know this fascinating bit of local history. Well done Brian! This really is a remarkable and unique piece of Banstead history - enhanced by an unusually clear photograph for its time. I love the fact that it's equipped with a horn... as if anyone wouldn't have heard the engine from a hundred yards away! Very interesting steering arrangement although it's not quite clear from the photo how it worked! Note from LNW: Watch this space Michael as I am on the trail of some video footage of this go-kart.